President Obama's "new chapter with the people of Cuba" has a familiar ring that amounts to an act of political plagiarism. Remember that according to Plagiarism.org "the practice of presenting as new and original an idea or product derived from an existing source" is plagiarism. On July 28, 2016 the President repeated an assertion he first made on December 17, 2014 that he was making "the most significant changes in our policy in more than fifty years" when he said that they would begin the normalization of relations with the Castro regime. The current Cuba policy is neither new or original but a copy of the policy pursued by President Jimmy Carter in the 1970s and President Bill Clinton in the 1990s that in both cases extended the life of the Castro dictatorship at the expense of U.S. national security interests with mass exoduses from Cuba and increased bad actions that led to the policy being reversed in 1981 by President Ronald Reagan and partially reversed by President George W. Bush in 2003. Let us also not forget that the first president to normalize relations with the Castro regime was President Dwight Eisenhower in 1959. Fidel Castro overthrew the Batista regime on January 1, 1959. On January 7, 1959 the United States recognized the new Cuban government ushered in by the Castro brothers and had actively pressured the Batista dictatorship to leave imposing an arms embargo in 1958. President Eisenhower thought that he could have normal relations with the Cuban revolutionary government which was also a reason the United States recognized it within the span of a week. In comparison it had taken the United States 17 days to recognize the government of Fulgencio Batista following his March 10, 1952 coup.What happened was that Fidel Castro began installing a totalitarian communist dictatorship, engaging in mass executions, expropriating U.S. companies , embracing the Soviet Union and seeking to subvert democracies in the region . This is what led to economic sanctions in 1960 and the end of normal diplomatic relations in 1961 and the embargo on February 7, 1962 during the Kennedy administration. President Obama's "new chapter with the people of Cuba" was neither "new" or with "the people of Cuba" but part of the Establishment's long game to normalize relations with the Castro dictatorship that stretches back six decades and time and time again proved negative not only for the people of Cuba, the people of the United States but also the people of Latin America generally. The claim made by many in the Obama administration that the current Cuba policy was new and original after 50 years of a static policy of isolation is an example of over simplification and political plagiarism that ignored the existing source of this policy during the Carter administration and its repeated failures in the 1970s, 1990s and not surprisingly today. Things are getting worse in Cuba today and negatively impacting the United States, but that shouldn't be a surprise it happened before in the 1970s when Carter did it first and it got Americans killed in the United States, and it happened again in the 1990s when Clinton did it again and it got Americans killed again. Alcoholics Anonymous recognizes that "Insanity is repeating the same mistakes and expecting different results". This sums up Cuba policy as repeatedly carried out during the Carter, Clinton and Obama presidencies. Cubans arbitrarily detained in Ecuador and deported back to Cuba. Washington, D.C. — The Inter-American Commission on Human Rights (IACHR) expresses its concern regarding the alleged eviction and arbitrary detention of nearly 150 people in Ecuador, as well as the alleged deportation of 121 Cuban migrants. The IACHR calls on the Ecuadorian State to adopt any measures that may be necessary to guarantee that all rights of migrant persons are respected, in particular their right to liberty, personal integrity, due process, and judicial protection, the right to seek and receive asylum, the principle of non-refoulement, and the right to family unity. According to publicly available information, on July 6, 2016, the National Police of Ecuador, as part of a migration control operation, cleared out a camp that had been set up in Parque El Arbolito, in Quito. The eviction was reportedly carried out without warning, and a number of individuals said that they had been victims of acts of physical and psychological aggression and that their belongings had been confiscated. As a result of this operation, nearly 150 people—including children, adolescents, pregnant women, and elderly adults—reportedly were detained and transferred to a prison facility and an immigration detention center. In addition, according to publicly available information, deportation hearings were held on July 7 and 8 at a court for minor offenses and juvenile offenders in Pichincha (Unidad Judicial de Garantías Penales, Contravenciones y Menores Infractores). According to Ecuador’s Interior Ministry, “of the first group of citizens of Cuban origin who attended the hearings, eight were released because they were part of a family unit, in other words, because they have Ecuadorian children. However, they should fix their immigration situation in order to obtain legal status in the country. Twenty-two individuals were released because they provided justification for their lawful stay in Ecuador.” A number of sources indicate that deportations of asylum seekers and refugees had been ordered. In addition, the Ombudsman’s Office of Ecuador expressed concern over the submission of such judicial decisions regarding deportations to a new, administrative jurisdiction, a situation that contravenes the principle of judicial independence. According to information from the Ministry of the Interior, on July 9 the first group of 29 Cuban migrants were deported; on July 11 another 46 migrants were deported; and on July 13 a third group, for a total of 121 Cubans deported. According to publicly available information, the deportees were not properly notified of their deportation orders, and the time frames available to appeal these decisions had not been respected. In keeping with its international human rights obligations, the Ecuadorian State should adopt all measures that may be necessary to ensure that racial profiling is not applied in the context of migration control operations. The State has a general obligation to respect all rights of migrant persons, including their right to live free of discrimination and free of all forms of violence and their right to personal integrity, personal liberty, family unity, and property. The Commission observes with concern that the information it has suggests that the Ecuadorian State has made use of automatic immigration detention without first resorting to alternative measures. In that regard, the Commission calls to mind that immigration detention must be an exceptional measure, used only as a last resort and for the shortest period of time possible. In addition, when migrant persons are detained, States should adopt the necessary measures so that those who are detained have sufficient information regarding the nature of their detention, the reasons for it, the procedural guarantees or safeguards to which they are entitled, and the remedies available to appeal or challenge their detention. Moreover, States may not resort to immigration detention of children and their parents as a precautionary measure to protect the goals of an immigration process or procedures to determine refugee status. The IACHR reiterates that, in keeping with international norms and standards, immigrants subject to proceedings that could lead to deportation must be afforded minimum guarantees. These include: (i) the right to be heard by the relevant authority in the context of the deportation proceeding and to have sufficient opportunity to exercise their right to a defense; (ii) the right to interpretation and translation; (iii) the right to have legal representation; (iv) the right to consular protection from the moment of detention; (v) the right to receive notification of a deportation order; (vi) access to an effective remedy to appeal a deportation decision; (vii) the right to appeal a deportation decision; and (viii) the right to suspension of deportation while the matter is under appeal. The Commission calls to mind that the Ecuadorian State has the obligation to analyze, establish a basis for, and decide individually on each deportation that is carried out. At the same time, the Commission reiterates that the State has the obligation to respect the principle of non-refoulement and therefore not to deport to another country, whether or not it is the person’s country of origin, any foreigner whose rights to life, personal integrity, or personal liberty may be at risk of being violated. The principle of non-refoulement is the fundamental standard of protection of asylum seekers and refugees. 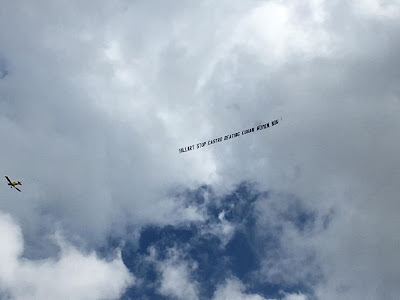 On July 23, 2016 a plane flew over the Florida International University Arena asking Hillary Clinton to help stop the beatings of Cuban women by the Castro regime and its agents. 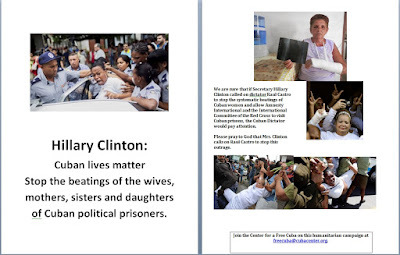 Over two thousand fliers were distributed on that day that called on Hillary Clinton to help put an end to the physical assaults on the wives, mothers, sisters, and daughters of Cuban political prisoners by calling on General Raul Castro to stop the systematic beatings against these women. Unfortunately one day later, with the non-response of Secretary Clinton to this request, in Cuba once again the wives, mothers, sisters, and daughters of Cuban political prisoners were beaten, kicked and had stones thrown at them when they tried to peacefully assemble in Havana, Cuba on July 24, 2016. 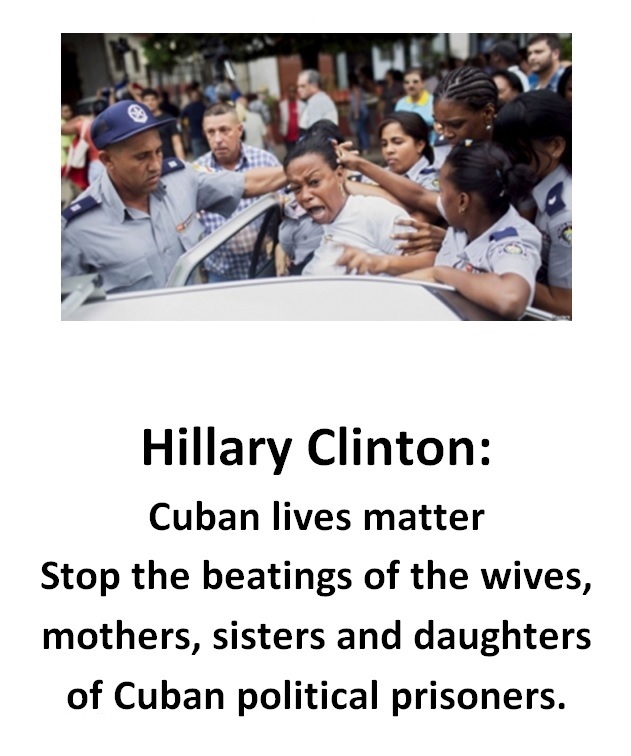 Candidate Clinton's silence on the Castro regime's continued systematic beating of Cuban women was answered loudly with more violence. This silence brings to mind the words of Archbishop Desmond Tutu, "If you are neutral in situations of injustice, you have chosen the side of the oppressor." Hopefully Hillary Clinton will speak out on behalf of Cuban women before the next attack. The video below was from July 18th and reflects what happened yesterday. 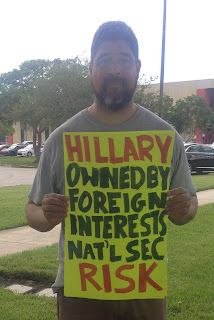 The rally today at Florida International University left a lot to be desired and follows a pattern in this presidential cycle of an election that bears a closer resemblance to World Wrestling Entertainment with Hillary Clinton and Donald Trump as the protagonists in a cage fight. Call for the audience at FIU to be fired up and energized. Dissenters attempting to counter with a different message shouted down and their banner quickly and aggressively pulled down. At the same time the level of political discourse continues its downward spiral. Meanwhile matters of great importance get short shrift but are still impacting the political process unexpectedly. Waiting for Hillary Clinton and Tim Kaine to appear, a number of speakers warming up the crowd one of them cited an abbreviated quote by Martin Luther King Jr: "History will have to record that the greatest tragedy of this period of social transition was not the strident clamor of the bad people, but the appalling silence of the good people." This is what is being witnessed today in Cuba with escalating levels of repression following the normalization of relations with the Castro dictatorship that Hillary Clinton advocated for when she was Secretary of State. Now when the Castro regime murders a young activist and orders a machete attack in an attempt to kill another, the government of the United States remains silent. The Center for a Free Cuba handed out fliers at Florida International University asking "Hillary Clinton: Cuban lives matter. Stop the beatings of the wives, mothers, sisters and daughters of Cuban political prisoners." A plane flying overhead with a banner put the matter more succinctly: "HILLARY, STOP BEATINGS OF CUBAN WOMEN BY RAUL CASTRO." "It is my personal belief that the Castros do not want to see an end to the embargo and do not want to see normalization with the U.S., because they would lose all of their excuses for what hasn't happened in Cuba in the last 50 years." Clinton's claim ignores a pile of evidence to the contrary. The Castro regime's international campaign against the embargo, they argue is not to get rid of sanctions but to explain their failures. This also necessitates ignoring: Castro regime's recruiting of state officials, members of congress, and corporations to lobby to end the embargo in the United States; that every Castro agent uncovered by the United States over the years infiltrated in government and academia has been working for the lifting of sanctions on the Castro dictatorship. Badly reasoned arguments that run counter to U.S. national interests begin to be understood when the money trail is established. International Business Times reported last year on the relationship between donations to the Clinton Foundation and arm sales to countries with terrible human rights records during Hillary Clinton's tenure at the State Department. In the case of Cuba it was Bill Clinton's presidency that opened up cash and carry trade in 2000 that brought in $5.2 billion dollars in sales to the Castro regime that also generated agents of influence and lobbyists at both the state and federal level. This trade peaked in 2008 and has steadily dropped during the Obama administration reaching a fourteen year low so far in 2016. This trade was never sustainable but part of a regime strategy to obtain credits and financing to shift the burden to U.S. taxpayers as was the case with other countries doing business in Cuba. James Prevor, President and Editor in Chief of the publication Produce Business in October of 2002 in the article, Cuba Caution, reported on how Cuba "had exhausted all its credit lines and, at best, was simply rotating the accounts. When the opportunity came to buy from the United States, Cuba simply abandoned all those suppliers who supported the country for 40 years and began buying from us." The suppliers were not the ones impacted by Cuba's failure to pay its debts, the taxpayers of the suppliers' home countries were the one's left holding the tab. This will mean that the Chamber of Commerce and Agriculture lobby will sell to the Cuban dictatorship and have the taxpayers pick up the tab if anything goes wrong. The record with other countries over the past half century indicates that the Castro regime will default on what it owes. Hillary Clinton's track record does not inspire confidence and is another reason why she should not be entrusted with The White House. Unfortunately, Donald Trump on normalizing relations with the Castro regime is but an echo of the Obama administration and Hillary Clinton only adding that he would have negotiated something better. Today, Saturday, July 23, 2016, Secretary of State Hillary Clinton, the presumptive Democratic Party candidate for president visited Florida International University (FIU) in Miami, FL in her first joint public address with her vice-presidential candidate Senator Tim Kaine. 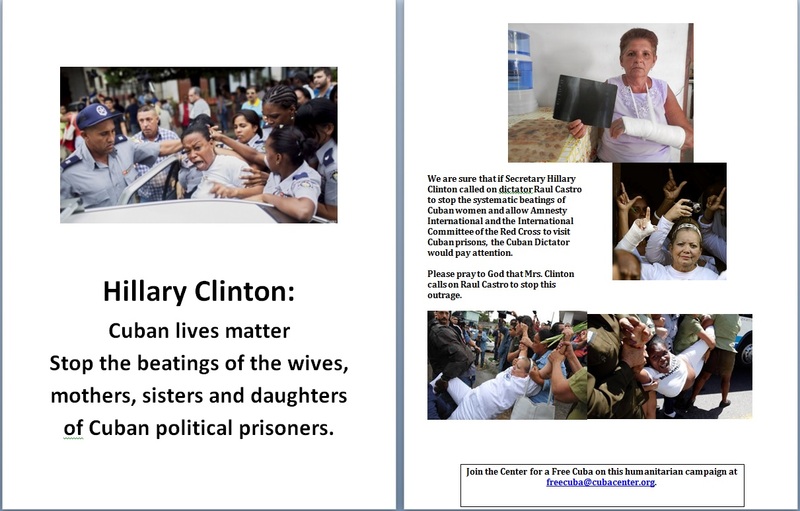 The Center for a Free Cuba distributed fliers asking Mrs. Clinton to bring an end to the systematic beatings of Cuban mothers, wives, and sisters of political prisoners that continue to take place on the island. The Center for a Free Cuba is a non-partisan human rights organization dedicated to the promotion of human rights, democracy, and the rule of law in Cuba. 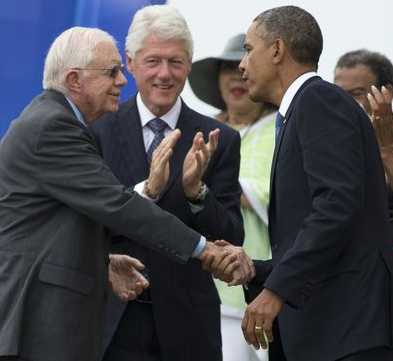 The Center’s president is Ambassador James C. Cason, former Chief of the American Mission in Havana. The Center’s Board of Directors and Research Counsel brings together several former American ambassadors, professors, business and community leaders. The Center repeats its call on President Barack Obama to condition any concessions to Raul Castro’s government on stopping the beatings of the Ladies in White, the abuse of political prisoners, and to allow Amnesty International and the International Committee of the Red Cross to visit Cuban jails. The Ladies in White is a group of peaceful women dissidents who were honored in 2005 by the European Parliament with the Sakharov Prize for Freedom of Thought. The founder of the group Laura Pollan died under mysterious circumstances in a Cuban hospital in 2011, at a time when Raul Castro and Barack Obama where Heads of State. Four years ago today, one of the most prominent opposition leaders, Christian- democrat Oswaldo Paya was murdered on a Cuban highway when Cuban political police forced his car off the road. Together with Paya, human rights activist Harold Cepero was also murdered. The regime has not provided a timeline from the moment that they were forced off the road, when they allegedly were taken to the hospital, when they were given medical attention, what type of attention, and when they died. Oswaldo Paya’s family continues to request the release of the autopsy report. There are more human rights activists that have been killed by Raul Castro’s regime, and to date, while other issues have been dealt with, the United States has not made these murders a high priority in its relations with Havana. All lives matter—all American lives matter, including the lives of Cuban Americans. Mrs. Clinton has yet to speak about several American terrorists enjoying the hospitality of Raul Castro in Havana after they killed American police officers and fled to Cuba. 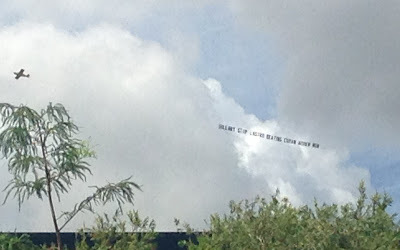 Mrs. Clinton has said that she supports Mr. Obama’s policy and remains silent to this day about the return to Cuba by President Obama of a Cuban spy who was serving two life sentences in an American prison for his role in planning the murder of three American citizens and one Florida resident by Cuban war planes that obliterated their two single-engine airplanes in international airspace while they were searching for refugees fleeing Cuba. Mrs. Hillary has said nothing about current Washing speculation that an American spy who worked for the Castros for years while serving at the Defense Intelligence Agency would be freed and returned to Havana. Ms. Ana Belen Montes’ treason resulted in the death of several individuals, friends of the United States. Mrs. Clinton spoke months ago at FIU, but she took no questions. We urged students and faculty at FIU to ask Mrs. Clinton earlier today to call on Raul Castro to stop the beatings of innocent women. Sadly once again today she did not take questions and her vice-presidential candidate mentioned learning Spanish in Honduras but made no mention of ongoing crises in Cuba or Venezuela. 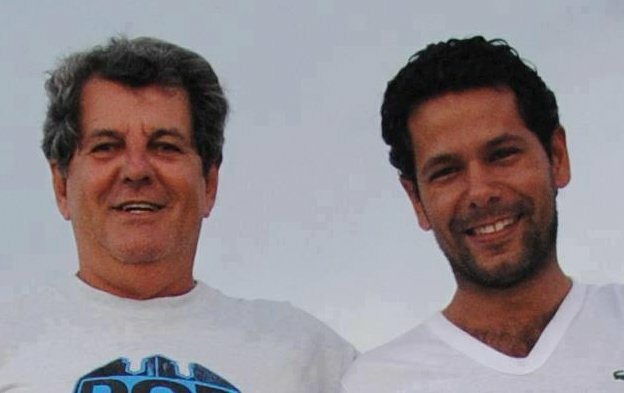 Today, July 22, 2016 marks four years since Oswaldo Payá Sardiñas, and Harold Cepero Escalante were killed in Cuba under suspicious circumstances that have led to demands for an international investigation, a report that points to the involvement of state security, and survivor testimony that points to murder. Today family, friends and admirers will celebrate their lives while praying for them as we continue to mourn their passing. The Christian Liberation Movement a month ago requested those who knew the two men to write an article or chronicle about them. Although I have been blessed to meet Oswaldo's and Harold's friends and family members over the years, fate did not allow me to meet them but on a couple of occasions speak with them over the phone. Nevertheless the words and actions of Oswaldo Payá Sardiñas, founding leader of the Christian Liberation Movement captured my imagination and admiration when I first heard of him in 1990. The Christian Liberation Movement's nonviolent vision of change is a radical rejection of the violence and hatred that define the ideology and political vision embraced by the Castro brothers and the dictatorship's iconic figure Ernesto "Che" Guevara. The violence visited on Werlando Leyva Batista, a 30 year old member of the Christian Liberation Movement in Holguin, Cuba attacked with multiple machete blows by one of the Castro regime's paramilitary on June 8, 2013 has been part of a pattern of worsening violence by the dictatorship that continues to be defied nonviolently. In remembering both martyred activists the words of Oswaldo Payá Sardiñas, and Harold Cepero Escalante must be remembered and their nonviolent legacy and example shared with others. “Already many Cubans have discovered and soon all of them will discover that this oppression, that this imposed lie, can be overcome recognizing ourselves as brothers to conquer our rights peacefully. So there is hope.” - Oswaldo Payá Sardiñas, Somos Liberación Havana, Cuba, July 2012. The extrajudicial killings of Oswaldo Payá Sardiñas and Harold Cepero Escalante on July 22, 2012 was not only the murder of two good men but the Castro regime's attempt to murder the future of a free and democratic Cuba. Today is a day that all friends of freedom should say a prayer for these two activists, their friends, families, and for Cubans in general. 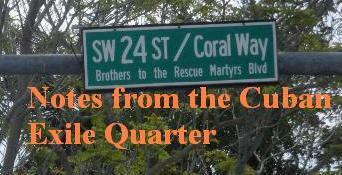 Tonight at 8:00pm at Our Lady of Charity (Ermita de la Caridad) located at 3609 South Miami Ave Miami, FL. 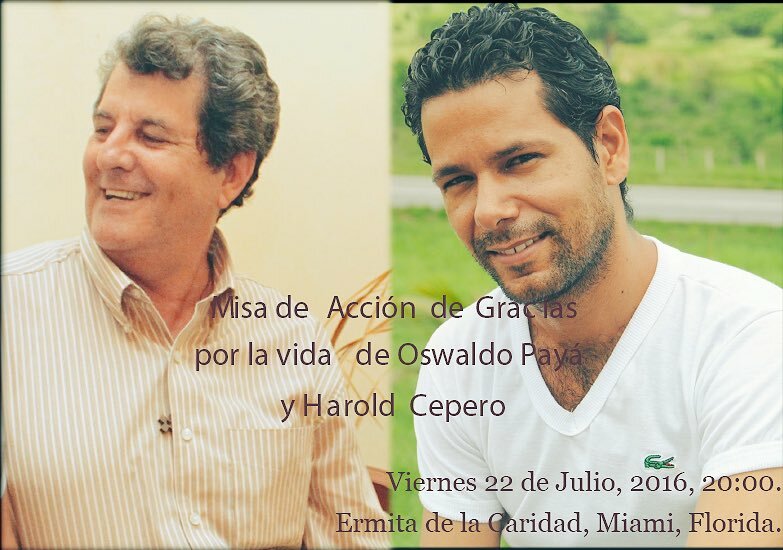 33133 a Mass to give thanks for the lives of Oswaldo Payá Sardiñas and Harold Cepero Escalante who sacrificed so much for Cuba's freedom will be held. Changing course to go in the wrong direction is not progress. Today the White House tweeted "One year ago, we changed course in Cuba" and claimed to have achieved "progress." Over the past year human rights have worsened in Cuba and overall situation has deteriorated. Unfortunately, the Obama administration's passivity before regime demands is partly to blame. One year ago today the Cuban Interests Section in Washington D.C. was formally re-designated the Cuba Embassy with Secretary of State John Kerry in attendance. Later on that same day the significance of this new relationship with the Castro regime was made evident in the treatment accorded to Rosa Maria Payá Acevedo. On July 20, 2015 at the State Department, Rosa Maria Payá Acevedo attended a press conference with Secretary of State John Kerry and Castro's foreign minister Bruno Rodriguez. Rosa Maria had proper accreditation as a member of the press. She has had articles published in news publications such as The PanAm Post and her own blog. This did not stop Rear Admiral John Kirby, who was transferred from the Pentagon and in May of 2015 became the new State Department spokesman, from taking Rosa Maria aside and warning her that she would be physically removed if she asked any questions or caused any kind of disturbance. Cecilia Bradley of NBC6 captured a blurry image of when Rosa Maria Payá was taken aside. The young activist tweeted a photo of Rear Admiral Kirby with the following text: "John Kirby kindly told me if I caused disturbances during the conference security would remove me." In a later tweet Rosa Maria reported that "Mr. Kirby asks me not to ask questions at John Kerry's press briefing or they would use force to expel me." 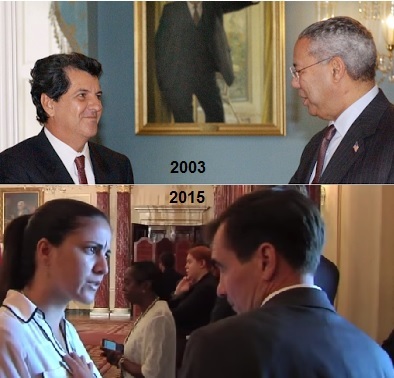 The United States Department of State in the space of twelve years has gone from Secretary of State Colin Powell receiving Cuban democratic opposition leader Oswaldo Payá Sardiñas to threatening his daughter with force if she dared to ask a question at a press conference in which Secretary of State John Kerry took questions with the Cuban dictatorship's Foreign Minister. The same dictatorship that martyred her father three years earlier. Is this what is now celebrated as progress by the Obama administration? A day later when Rosa Maria Payá Acevedo attempted to present a letter to the Cuban embassy requesting her father's autopsy report she was not allowed to turn in the letter and a patrol car was called. Since 2012 the Payá family has been requesting Oswaldo Payá Sardiñas's autopsy report from the dictatorship and has yet to be given a copy as they are entitled by law. This is not how the embassy of a country behaves, but it is how a totalitarian dictatorship does. This is why South Florida residents protested placing a Cuban Consulate here earlier this year. President Obama changed course on Cuba from Secretary of State Powell receiving a Cuban democratic opposition member in 2003 following a petition drive signed by more than 20,000 Cuban nationals demanding democratic reforms to the Secretary of State's spokesman threatening an accredited reporter with physical removal from the State Department because her father was martyred by the dictatorship (this administration normalized relations with) to prevent her asking a question at a press conference to the foreign minister of that regime. Diminishing the moral stature of the United States government is the opposite of progress. Rosa Maria Payá Acevedo in a tweet summed up this new reality perfectly: "I didn't think I would receive in the State Dept the same kind of coercive warning security at the Panama airport gave me." Donald Trump officially won the Republican nomination for President of the United States last night in Cleveland. The question many are asking is: How did the country get here? Consider the following facts and the reasons for the political earthquake become clear. African Americans in the United States can expect to live until age 76, while white Americans are likely to live until age 79, on average there is a 3.4 year difference. This is an improvement over previous years with both African Americans and Hispanic mortality rates steadily dropping. However since 1995 white mortality rates have dropped at a slower rate when compared to other groups. Worse yet between 1999 and 2014 mortality rates among middle class whites have actually increased while that of other racial groups have continued to decline. Main causes of this increased mortality are: suicide, chronic liver diseases and cirrhosis, alcohol and drug poisoning. This trend is not being repeated in other European countries. According to a December 2015 Princeton study this "silent epidemic" has claimed half a million lives and can be traced to distress in the population with the inability to find work a major factor. There is also new data that points to increasing mortality not only among middle age but also young whites. How does all this relate to the 2016 presidential election? According to Jeff Guo in The Washington Post on March 4, 2016 Donald Trump performed the best in places where middle-aged whites are dying the fastest. The official government unemployment figure is 4.9% but other reliable and more accurate statistics range between 6.3% on the low end to the U6 unemployment range which is 9.9%. More controversial but accepted in some quarters is John Williams' Shadow Government Stats that places June 2016 unemployment at 22.9%. These numbers provide plenty of room for despair. First is the fact that official numbers promoted in the mass media are not necessarily accurate. Secondly, the disappearance of higher paying manufacturing jobs has been the result of trade agreements that have negatively impacted U.S. workers but at the same time has benefited and enriched a powerful few. Most of U.S. manufacturing ended up in mainland China and has assisted in modernizing that country and its military which is now expanding in the region and making itself felt worldwide to the detriment of U.S. national and security interests. How has this bipartisan China policy benefited the average American? This is not being discussed on the national stage. If the political and media elite are unwilling even to address the problem with accurate statistics then what hope is there of solving the problem? 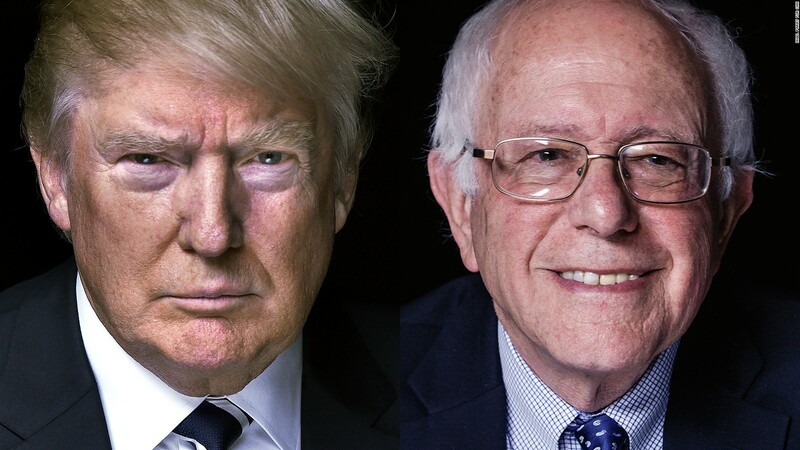 This is why the Trump and Sanders phenomenons erupted on the national political scene. Voters are frustrated. Meanwhile rather than having this national conversation the debate has been returned to the old obsession and the so-called "original sin" of the United States: Race. Consider for a moment that according to The Washington Post 990 people were killed by police officers in 2015 out of a total of 12.2 million arrests with nearly half of all killed being white non-hispanics followed by a little over a quarter that were African American and 17% who were hispanic. A disturbing subset of data was the statistical breakdown of 93 unarmed individuals killed by the police in 2015 with four out of ten being African American followed by three out of ten being white non-hispanics and nearly two out of ten hispanics. Meanwhile there were 42 police officers shot and killed in 2015. There is a problem that needs to be addressed but it has been magnified and distorted by the media and political actors to create the sensation of a clear and present danger for African Americans when being stopped by the police facing a great risk of being killed. The high profile killing of police in the United States in reaction to a media campaign demonizing the police will also have an impact in the presidential election. It is interesting that those publicly mentioned as possibly funding Black Lives Matter have an interest in maintaining the status quo on trade and globalism in the United States and avoiding a national conversation on these two subjects. This brings us to a topic that the political and media elite are at odds with the majority of the citizens of the United States and that is immigration. Fredo Arias-King served as senior adviser to the National Action Party of Mexico during its presidential campaign in 1999–2000. In July of 2006 he wrote an important paper for the Center for Immigration Studies titled "Immigration and Usurpation: Elites, Power, and the People’s Will" about the disconnect between public opinion and elite actions in the United States with regards to illegal immigration. Arias-King speculated in this paper what motivated U.S. politicians to tolerate and even encourage the phenomenon of illegal immigration and where it could eventually lead predicting the rise of a Trump-like candidate that could seize the immigration issue to respond to the demands of a populace outraged at the lack of response from the political class. Samuel Huntington speculated that the American "creed" (values and beliefs) cannot be used to openly oppose mass immigration.16 That may change. So far, the immigration debate has centered on the immigrants themselves—whether they are worthy or unworthy. This debate is a red herring, since average Americans are unusually kind and restrained in the face of mass immigration, something that cannot be said about other nations (including Mexico).17 Recent poll findings from Zogby challenge the popular belief that the average American somehow has negative or overtly prejudicial feelings toward Mexicans in particular.18 However, Huntington did not take into account the possibility that the debate could yet be framed in terms of potential usurpation from the political class using immigration as a tool. If an organizeable mass of Americans comes to suspect that mass immigration from Latin America is being used by the political class to undermine their democracy and as a tool to liberate the political elites from the Jeffersonian and Madisonian constraints, then indeed we may witness a reaction—but hopefully not against the immigrants themselves, as they are also objects of elite manipulations in more than one country. The Founding Fathers also prescribed a cure for usurpation. Hopefully the American people will not apply it so literally, for the sake of those legislators. The conclusion reached by the author that the American political class was using mass immigration to change the electorate in order to make the citizenry more malleable and thus politicians able to get away with being less accountable was a controversial proposition in 2006 but seems much less so today. 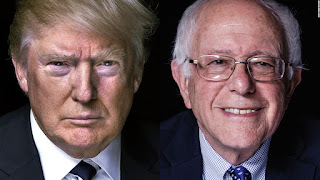 The loss of faith in governing institutions in the United States by large sectors of the electorate is behind the success of Donald Trump, a business man with no political experience and Bernie Sanders, a socialist with a communist background who honeymooned in the Soviet Union in 1988. However Sanders was against open borders and globalization but his support for an amnesty for 11 million in the United States probably cost him the nomination. Foreign policy failures are felt here in the United States. The argument that we fight them over there to avoid fighting them over here rings hollow in the electorate who are now backing a candidate who opposed the war in Iraq. Terror attacks linked to Islamic extremism have impacted across the nation in recent years: Orlando, Florida (2016), Chattanooga, Tennessee (2015), San Bernardino, California (2015), and Boston, Massachusetts (2013). Meanwhile events in Turkey point to an ominous new turn with Erdogan's consolidation of power, purges, and crushing of the military following what appears to have been a coup with a counter-coup underway that could lead to the rise of a fully Islamic regime in NATO. The cry of "who lost Turkey?" may become a theme in the foreign policy debate in the presidential election in the United States this fall. There are other hot spots in the world and Libya can be blamed directly on Hillary Clinton. These are trying times for the American Republic and the social, political, and media elite had best wake up, look out for the interests of their fellow citizens, and how to rebuild the middle class or get out of the way.